One of the most intriguing exceptions to this rule is Venezuela (a pesky foreign government), where Hugo Chavez, as an extraverted socialist, has turned the standard dynamic on its head in recent years. His primary goal appears to be increasing the standard of living for the people of his country. To do this has meant changing the status quo for the establishment of his country and the international oil companies (IOC’s). Not a very popular idea in many circles. Increasing control and nationalization of energy resources is not a new idea. Over the years, we have seen a similar process in Mexico (1938), Iraq (1960-72), Saudi Arabia (1950-80), Iran (failed attempt 1953, success in 1973), Libya (1970), Algeria (1971), Russia (re-nationalization 2003-05), Ecuador (2006), and Bolivia (2006) as part of the list. Retaining a larger share of the profits from the resource to allow financial autonomy and to increase social benefits for their citizens. The realization, that in most cases, the financial and technological requirements for oil development can be obtained without giving away the ship. The model of the multi-national oil major being able to dictate terms is less common today. The knowledge that their resources are limited and that control over production levels to increase or decrease production according to national objectives is crucial. The history of colonial powers such as France, England and the United States in matters of oil gives us many rather sad instances where the military or economic weakness of oil rich states have been exploited. The example of Iran in 1951 failing to negotiate better royalty rates with the predecessor of British Petroleum is typical. When Iran nationalized the industry, Britain blockaded the export of Iranian crude with British intelligence and the CIA responsible for a coup that toppled the government in an early example of “regime change”. The Shah of Iran was re-instated and did the bidding of both British and American interests through repressive government. The fall of the Shah in 1979 led to the hostage taking at the American embassy. Subsequent behaviour by the US during the Iran-Iraq war provided further fuel to the fire. Present day relations between the US and Iran is related to “blowback” from the covert activity of the early 50’s. Back in Venezuela, a 2002 coup attempt temporarily removed Chavez and to supporters of Chavez appears to have some links to the US. It may be some years before the allegations can be confirmed. Based on a few of the known interventions by the US in the governance of Guatemala (1950’s..), Dominican Republic (1960’s), Congo (1960’s), Cuba (1960’s), Chile (1973), Haiti (1980’s), El Salvador (1980’s), Nicaragua (1980’s), Grenada (1984), Panama (1989), it appears to be a plausible scenario. Since 2002, the rocky relations between the US and Venezuela have become even more strained. Chavez is seen as a “socialist with deep pockets” and a serious risk to US control of Central and South America countries. Support from Chavez provides those countries with some choice in their economic and political policy decisions. The balance of power in the oil industry is changing as well. At this moment, the percentage of oil under the ownership of national oil companies (NOC’s) is roughly 85%. IOC’s such as Exxon Mobil, BP, Total, Chevron, Repsol produce only 12 million barrels a day compared to the 85 million total world output. Big oil (IOC’s) claim that they are kept out of many areas where their expertise and money would mean higher production. This is true in some cases. However, the only place where it may change is Iraq, where the invasion has had as a principle goal the privatization of oil, and the entrance of American and British oil companies. Given the $1.3 trillion cost of the war to date and the failure of the Iraqi government to pass the oil laws demanded by the US, it is not a cost-effective way to stimulate privatization. In the future, the amount of oil that will be available to the open market may decrease in addition to geological depletion. National oil companies (China) are making contracts with oil nations, offering them billions in loans, and development technology in exchange for long-term supply contracts. In the short term, that volume may be sold on the open market. However, when shortages appear, these volumes could revert to the home country. Given this case, those buying on the open market will be the hardest hit – an area like Eastern Canada for example. Secondly, the growth of NOC’s may continue to increase at the expense of the international oil companies. The IOC’s have not yet adjusted to the change in roles and the best use of their technology in cooperation with the NOC’s is not in place. As the price of oil rises, exporting countries may be satisfied with lower export volumes to conserve reserves and revenues for the long term, worsening the supply problem. What will be Canada’s national strategy to declining world production? It is not clear to those of us who are the most at risk (Eastern Canada). Perhaps we could all just act surprised when the going get rough? Steve Wilcox, one of the readers of this column, suggested I write about the good value that electricity provides for our lives. He is a smart engineer and that isn’t an oxymoron in his case. (Oxymoron examples – clean coal, government organization, tax return and you soon get the drift). When an elevator takes you up to the 15th floor of a building, few of us give it a second thought, unless the elevator is broken and we have to walk up. We tend to take things for granted. Electricity is ubiquitous, inexpensive and not at all respected for what it can do. (Ubiquitous = being everywhere, omnipresent) I just hate it when a word slips into general usage and I didn’t get the memo on it. A kilowatt-hour costs roughly 10 cents and provides you with 1000 watts of electrical energy for an hour. By comparison, a human can only provide a peak work output of 500 watts for several seconds. A level of 200 watts output from a trained athlete can be sustained for several hours and was enough for the amazing man-powered flight across the English Channel back a number of years ago. One can quickly see that the human body could not sustain a lifestyle of lighting, heating or appliances. And who would want to be tied to a bicycle generator for 8 hours a day working for a measly 10 cents a shift. We have been seduced by the plentiful, low cost supply of electrical and oil based energy sources to fulfill our desires. Our houses have become filled with appliances, grown much larger and we have bought large cars and trucks. Our cities sprawl over large distances without efficient public transport. A litre of gas costs roughly $1 with taxes and refining costs. It contains 35,000 Btu’s and when burnt for transportation purposes will last 25 kilometers in a car with excellent mileage (4L /100 km) but only 6 km in a vehicle with a poor rating of 16L / 100 km. At its best, that is 4 cents per kilometer. The use of electricity for refrigeration is a remarkable value as well. Before electrification, ice blocks were cut in winter, stored, and transported to homes for use in iceboxes. We are now able to keep our food fresh and safe for a very small cost of electrical energy. Efficiency NB tells us that an efficient fridge uses 405 kWh per year or a little over 1 kWh per day (11 cent/day). An inefficient unit from 1984 uses 1457 kWh (40 cents / day). The annual difference is $105 per year – enough savings to justify a changeout. The biggest use of electricity in our homes or apartments is for water or space heating. Oil and wood heat remains to some extent. Natural gas is prominent in many provinces across Canada. Central heating controlled by thermostat is extremely convenient for our society and has become the norm due to the low cost of energy. If the average salary in Canada is $38,000 per year, then a total home energy bill of $2500 per year is 6.5% of gross salary. Your percentage may vary based on salary, heating / electrical bill and size of home. Most people would not be willing to cut their own wood in the forest or go back to one woodstove as the only heat source in their house. We may complain but we realize how great a value energy really is. If the world had infinite sources of energy, no changes in our lifestyle would be required. However, with 6.6 billion people on this planet demanding resources, something has got to give. 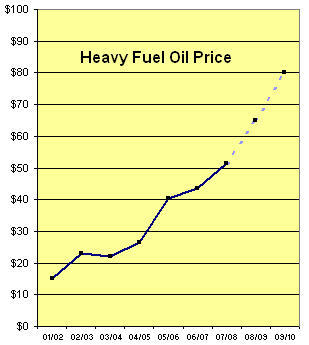 A recent sign is the rising price of oil, which indicates some real difficulties in world supply. Given that the supply will eventually start a downward trend, what would be our appropriate energy strategy? David Hay of NB Power recently indicated that the price of electricity is too low to encourage conservation. Very true. Unfortunately just raising the cost of electricity is not politically feasible at this moment. However, raising the price of a kWh while simultaneously lowering the provincial income and corporate tax rate by an equivalent amount is a neutral step that gives money back to the people and makes saving energy into an interesting proposition for us. Taxing the carbon-based production facilities of NB Power does the transfer of the money. The government should also agree on an accelerated time frame for power rate reform from declining to inclining block, again on a neutral basis. The reduction of the gas tax by Shawn Graham after the last election was a retrogressive step. Re-installing the tax with compensating subsidies for vehicle efficiencies and public transport would be tax neutral and encourage conservation. Sweden has a plan. “Our dependency on oil should be broken by 2020,” said Mona Sahlin, minister of sustainable development, in an interview with The Guardian newspaper. How do they plan to do it? What is our plan for New Brunswick? When the price of a barrel goes above $100, will we see a plan? Perhaps, when the price of oil hits $150. So far, the rising Canadian dollar has taken the sting out of recent increases. Electricity and gas are worthwhile at twice the price of today and the sooner we get there the better off we’ll be in the long term. Shawn Graham seeks transformational change in this province. Unfortunately, he doesn’t recognize the real problem. It’s a notable event when oil hits over $90 per barrel. Taking a moment to reflect on the occasion could be of some value. Only a year ago, we saw a price of $55 dollars. Simple logic of supply and demand would indicate that supply is very tight at this moment. Back in 2005, surplus capacity had declined to roughly a million barrels a day, a very thin margin when dealing with daily production of 85 million barrels. Today, Saudi Arabia claims to have spare capacity of over 2 million barrels / day but has effectively cut production by 1 million barrels over the past two years, perhaps to support prices. OPEC has not yet used that capacity to push oil fluctuations downward but promises some production increases starting in November. Saudi Arabia might be able to lower prices on a short-term basis. But, are higher prices a bad thing? The answer is mostly no. Naturally high prices affect people and business temporarily, but they also drive conservation, energy efficiency and ultimately greater independence that is greatly needed to reduce consumption. What are the prospects for our long-term supply of oil? The editor of the UK Petroleum Review, Chris Skrebowski sees it as a problem of “oil flow.” If you can’t get enough product out of the ground or through the refinery to the market, then reserves mean nothing. With his megaprojects database, he has been tracking increased supply (oil flow), subtracting expected depletion rates of fields (roughly 4 million barrels / day) and comparing the result with projected demand since 2003. Since the time line from discovery of oil to commercial production averages 6 years, a prediction of new production till 2012 can be made. The result of his analysis shows a peak for oil production in 2011. “Peak oil” is considered to be when flows are inadequate to meet demand after which supply will start its natural decline. “It’s real, it’s imminent and it’s going to be unpleasant” he indicates. An optimistic view has been usually provided by the International Energy Agency (IEA). The IEA, in a recent report expects world spare oil production capacity will shrink after 2010, and a “supply crunch” is likely. Fatih Birol, the chief economist, indicated in an interview in Le Monde that ” if the production in Iraq doesn’t increase exponentially from now to 2015 we have a very large problem, even if Saudi Arabia fulfills its promises.. of 3 Mb/d. The numbers are simple..… it will not be sufficient to meet the Chinese demand.” Queried on the growth of demand – “Unfortunately, there are lots of words but few actions. I hope that the consuming nations understand the gravity of the situation and put in place very strong and radical policies to slow the growth of oil demand.” The IEA has been predicting an increase of 2 million barrels a day in 2008 and an output level of 120 million barrels a day by 2030. Peak oil is now. It is expected that world production will initially decline by several percent a year and by 2030 will be 39 million barrels per day – half of today’s figures. Global proven reserves are smaller than believed by others – 854 Gb as opposed to the IHS Energy database figure of 1255 Gb. The area of difference being the numbers related to the Middle East. The major international oil companies, in aggregate, have not been able to increase their production in the last ten years. A growing supply gap has been caused by the decline of the North Sea fields and the Canterell Fields in Mexico. Additionally, Saudi production has been reduced by a million barrels a day – either a choice of the kingdom or as a result of declining production. What are we to believe? IEA, an official energy-monitoring agency that has been predicting no problems to 2030 now shows doubts on capacity. Will they soon disavow the optimistic reserve pronouncements of the US Geological Survey? The size of discoveries has been shrinking since the 1960’s and we now use more than is being discovered. And we expect to increase the flow by 50% when the cheap and easy to find oil is gone? A number of independent scientists and geologists have been forecasting declines based on the data that they see and the fear that the promises of Saudi Arabia are hollow. They see severe economic storms that threaten the very nature of our society in coming years. George W. Bush, the geopolitical genius of our time, went to war in Iraq to conserve US control over Middle East oil and probably to have the “majors” develop the higher potential of the Iraqi oil fields, something not possible with Saddam Hussein in place. Alan Greenspan, the former chairman of the Federal Reserve said in his memoirs “the Iraq war is largely about oil.” Former US General John Abizaid also recently confirmed this. Based on recent posturing, it appears that a second oil war is possible with Iran. The official charge of “wanting to manufacture nuclear weapons” seems a bit thin given that Pakistan next door is a notoriously unstable state, possessing multiple atomic bombs. At the moment, Pakistan is a useful and pliable ally of the US and doesn’t have any oil. Iran is guilty of the crime of “having an independent foreign policy” in the same way that Cuba does. Should the US decide to bomb Iran we should expect the removal of 4 million barrels from world markets with huge increases in the price of oil. When Iran then retaliates on Saudi facilities or blocks the Strait, the damage to the world economy would be irreparable. The cost of a deficient energy policy for Canada is high prices, lost opportunities, and eventually an unstable supply. If there is lots of oil, why are China and the US, the two major users, each going after control of supplies in a panic mode? Put on your seat belts. This could be a rough ride. That little farming community was settled in the early 1800’s on marginal land full of rocks and hillsides. Listening to stories of working in the wood camps from dawn to dusk for a dollar a day was fascinating to a child interested in history. Interspersed with the truth were incredible yarns of the exploits of Paul Bunyan, a giant woodcutter and Babe, the blue ox. Those stories kept us interested while travelling on car trips. Woods work meant cutting trees with axe and bucksaw and the use of horses to pull the logs out to the road. During the winter, the roads were not ploughed and skis were installed on the buggy to allow travel when necessary. Heating in the typical farmhouse was by the central wood cookstove. Due to poor insulation and wind infiltration, the houses were cold by morning, sometimes freezing the chamberpot. What was also incredible was storing meat upstairs, as certain rooms were cold enough to be temporary freezers. At some point in time, the family had a Model A Ford. Neil finally got an invitation for an all expense paid trip to Europe in 1942 and in later years told us some stories of the travels to countries such as England, Italy and the Netherlands and of course the seasickness on the crossings of the Atlantic. After the war, life changed with the proliferation of cars and oil heat. He went to work for NB Tel in Saint John climbing poles and repairing lines. Although the standard of life was becoming easier for everyone, he retained the work ethic and thriftiness learned from the hard economic times of the great depression. Never one to waste anything, he was always generous with others. He would buy potatoes in bulk and grow other vegetables in a garden. Some vegetables were bottled and some kept in a cold room to last most of the winter. Our discussions on the future of the world in recent years were interesting. I had come to appreciate his wise use of resources, always trying to fix it up and make it do. Oil has transformed our world, whether it is with large machinery moving earth, or the ability to fly around the world on a whim. What should be clear is that we are starting on the downward slope to a world with considerably less energy. Oil has gone from $55 to $90 a barrel in a year as production reserves decline. Although oil at $90 dollars a barrel is still relatively inexpensive for the work that it can do, it likely will go considerably higher. At $250 or $350 a barrel or more, our lives are going to change. Will produce from foreign lands be available? Will you have a job? Will you have money to heat your home and gas your car? Will the social safety net developed over decades slowly disappear? Air travel will decline to a fraction of the present day levels and will be replaced by trains and horses. The road system will decline. We have been living in a world of peace and prosperity in North America and we mistakenly assume that it will continue. Is our past really our future? Of course it is. We are not preparing for anything different. In the absence of a plan for the future, our future will do the plan for us. It is quite natural that our political leaders avoid talking and planning for the future. It is most uncomfortable to admit that we have failed to understand the real nature of our position on this planet. My father saw the transition from oil independence to dependence. I will see a portion of the transition back to independence, which will be involuntary on our part. Our children may live in poverty and desperation. There is a small chance that we can change our future, if we were to start soon. But life is fleeting. We are now losing the older generation that has lived through times greatly different from the disposable society that we now experience. I will miss the advice of my father who was one of the kindest and wisest men I have known. A very bright light was recently extinguished by the ravages of time. Without that experience, can we see clearly enough to organize our world better and make it really sustainable? As a simple example, do we really need to use fuel to import bottled water from Fiji to North America?